In the previous articles How to Purposefully Direct the Life Force Part 1 and How to Purposefully Direct the Life Force Part 2, I had provided a basic description of the life force that pervades all things and described the basics of the simple plant alchemy experiment to be carried out to demonstrate the influence of this force on living things. In addition, I had outlined the items required to carry out the experiment as well as my findings within the first six days of the experiment. -There is a life force that pervades all things. -This life force is the permeating energy that animates all manifested life. -You may further express and accelerate the growth of manifested life through purposefully channeling your own individual consciousness. -The effects of focused consciousness may be demonstrated by means of a basic, inexpensive alchemical plant experiment. -The growth of a plant may be further accelerated by invoking the earth elemental PRITHVI and creating conditions that are conducive to this invocation. -The symbol of the Earth Elemental PRITHVI is a green square (eastern alchemy tradition) or an inverted triangle intersected by a horizontal line (western alchemy tradition). -The mantra “OM LAM PRITHVI-DATU NAMAHA” is used to PRITHVI and should be chanted 108 times while forming the PRITHVI mudra. -To further optimize the growth of a plant earth energy may be transferred within oneself to the plant through the PRITHVI symbol by means of a visualization process. -Composer Arvo Part developed a musical technique called tintinnabuli that is said to create euphoria inducing harmonies that are beneficial for the growth of plants. The alchemical plant experiment described within this series of articles is comprised of two plants – Abundance and a second plant. 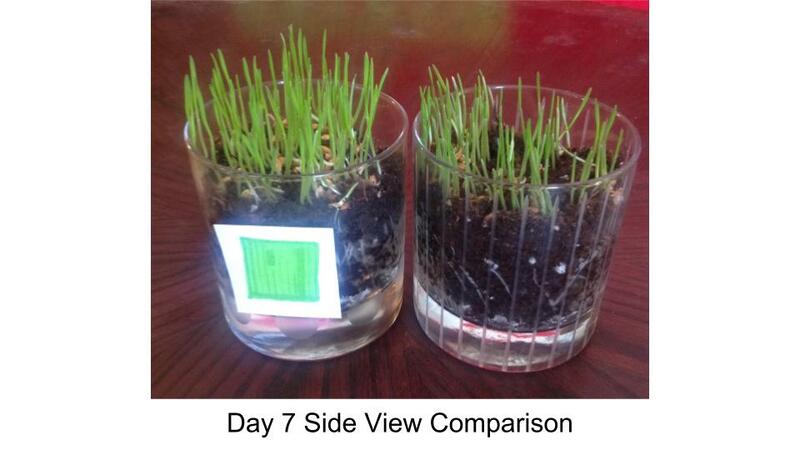 Both plants were subjected to the same material support (sunlight, water, etc.). However, there were subjective, subtle exposures to the two plants – the first plant, Abundance, was subjected to focused sessions of positivity, classical music and verbal reinforcement. The other plant was shown indifference and was pretty much ignored with exception to basic material support. The details of the first four days of this experiment may be found in the first article of this series, How to Purposefully Direct the Life Force Part 1 and the second article, How to Purposefully Direct the Life Force Part 2. This article describes my observations of this experiment on Day 7 and provide a list of resources that you will find useful should you desire to dive deeper within this facet of alchemy. -The wheat grass stalks appeared straighter. -The wheat grass stalks appeared to possess greater body and a fuller volume. 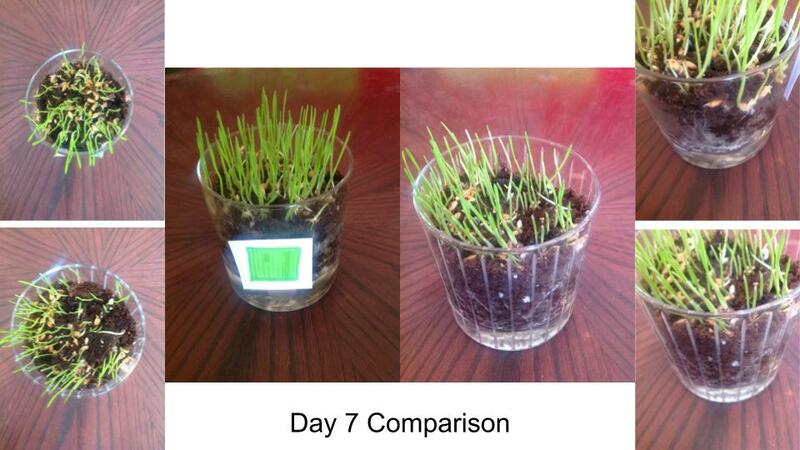 -The wheat grass stalks appeared to be greener. -The roots were stronger and more plentiful. Overall, Abundance appeared to have a healthier glow and fuller look when compared to the other plant which had grown spindly. Although the other plant was functional, Abundance appeared bountiful. An apt comparison may be made to hair, one instance may be thick and full-bodied, the other thinner and sparse. Recall that the only differences between the two plants throughout the duration of the experiment was that of channeling of the life force and consciousness into Abundance, exposure to classical music and neglect of the other plant. All other material support and material conditions remained the same. Neither plant required water on Day 7. 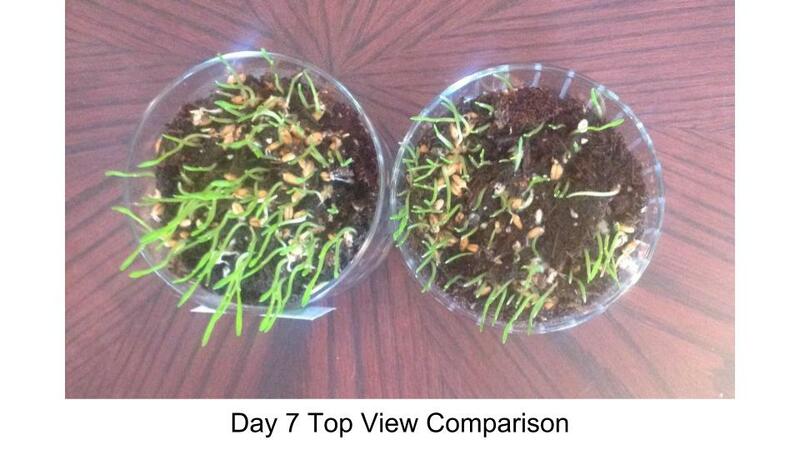 The following collection of images is a comparison between the two plants on Day 7 as seen from different views. The top images on the left and right are of Abundance and the two bottom images on the left and right are of the other plant. The centralized image on the left is of Abundance and the image on the right is of the other plant. Day 7 was the final day of the experiment. It is interesting to note that although material support was consistent between the two plants, there was a noticeable difference between the richness and fullness when comparing the two plants. This evidences and showcases a key facet of alchemy – the consciousness of the alchemist themselves. The more pure the channel for divine consciousness, the greater the impact one will have on the expression of life. My next article will provide additional insights into these subtle and subjective aspects that are present behind manifested life and some of the key lessons that resulted from this experiment. -Wattles, W.D. The Science of Getting Rich. -Weed, Joseph J. Wisdom of the Mystic Masters.